Meet Jimmy Gabana and his partner in life and in bread, Laetitia Meunier. 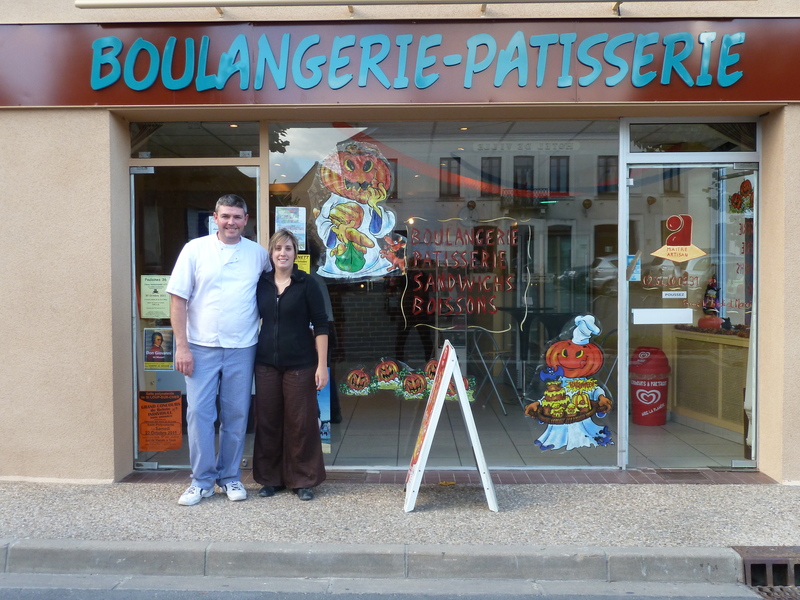 In February 2011, Jimmy and Laetitia opened their first Boulangerie together in Chabris, a village of 3000 souls in the Indre département (36). It might seem a little risky going into business in these uncertain times and Jimmy will be the first to admit that setting up shop wasn’t easy, Un parcours de combatant, he says. Jimmy is passionate about his job though, « making bread is sensual » and he wouldn’t earn a crust doing anything else. In November 2011, I went down to Chabris to talk Baguette with Jimmy and Laetitia. Why did you become a baker? How do you become a baker? It’s like any artisan job. You’ll leave school after the troisième and do a C.A.P over two years. A CAP is the Certificat d’Aptitude Professionnelle. It’s the basic professional qualification for all trades; bakers, butcher, plumbers, electricians, even florists. The CAP takes two years. In the first year, you learn the rudiments of the job and in the second year, you serve an apprenticeship. It’s a good way to learn a trade, but as for the tricks of the trade, that’s all down to experience. You’ve just opened your first Boulangerie, isn’t a bit risky going into business, we are living in hard times. If the baker doesn’t work, no one works. We’ve all got to eat. People might cut back on other foodstuffs, but they’ll always eat bread. However, the customers want quality, so if I can give them a quality product at a reasonable price, I’ll always be able to earn a crust. How much is your baguette? Our baguette retails at 80 Euro Centimes. This may sound expensive compared to supermarket bread, but our baguette is traditionally baked and will keep overnight. True, supermarket bread can be a lot cheaper, as little as 35 centimes in some hypermarkets but it is never the same quality. Supermarket « bakeries » merely cook pre-frozen baguettes It has to be eaten straightaway. The supermarket baguette you buy in the morning will be rock hard by dinner time. You get what you pay for. What makes a good baguette? Quality ingredients, a traditional recipe and after that, it’s all down to the skill of the baker. I said that making bread is very sensual. The baker has to treat his dough like his wife, with the same respect and tender loving care. As for the finished product, it should have a crisp and crunchy crust on the outside and a good honeycombed appearance on the inside. What we call the mie should never be too dense or compact. A lot of supermarket bread is just far too doughy. The boulangerie is not just a one-man operation; tell us about the role of the baker’s wife? The Boulangère sells the bread. Smile and style are all important. No matter how good the baguette, if Madame is miserable in the mornings, the customers won’t come back. The boulangère needs a good line in chat, a sympathetic ear, as well as good numeracy skills. Without the boulangère, the boulanger is nothing. Tell us about an average day. It’s long. I start at 4am and finish very late. The boulangerie itself opens at 6.30. We close at 7pm, but after that we have to clean up and do the accounts. We generally finish around 9pm. I understand why many young people aren’t attracted to this line of work. They are put off by the long, and anti-social hours. There are 33,000 Boulangeries in France, employing roughly 140,000 people (baker’s, sales staff, apprentices). The best selling bread in France is the 250 gramme baguette, retailing at an average price of 80 Euro Centimes. Everyday, 98% of French people eat bread. The average French person consumes 58 kilos of bread per year. Salaries in the industry vary. A young baker will earn roughly 1500 Euros net per month. A well-established baker with his own shop and a good client base can, earn between 2500€ and 3000€ net per month.